Earlier today, President Trump traveled to Annapolis, Maryland to deliver the commencement address to the 2018 graduates of the Naval Academy. His speech was filled with hope and his spoke of the pride we, as a nation, have for our best and brightest who choose to serve – not because they’ve been drafted to war – but because they feel a sense of duty to country. 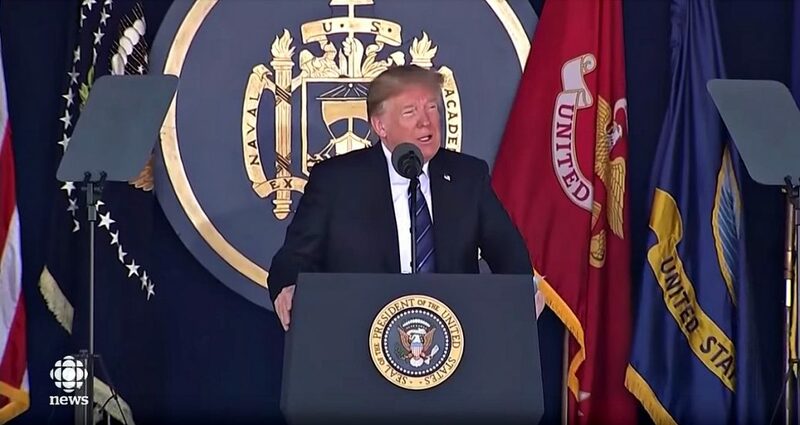 Trump encouraged the graduates to stand strong for what they believe and to fight for the nation they love because “cynics and critics” are trying to tear down our nation. Because we know that a nation must have pride in its history to have confidence in its future. Each of you inherits the legacy of the heroes who came before you. It’s a living history passed down from officer to officer and generation to generation. Each of you will make your own mark on the Navy, the Marine Corps, the military, and a history of our great nation. Seize today and you will shape tomorrow. In a few moments, you will be commissioned into the mightiest fighting forces of the air, the land, and the sea. Together, you will blast off carriers of which we are just now finishing, the largest aircraft carrier in the world, and launch off submarines of which we have many under construction and ward off evil. You will bring comfort to our friends and strike fear into the hearts of our enemies. Among our graduates today will be 283 naval aviators, 134 submariners, 256 surface warfare officers, 70 restricted line officers, and 15 explosive ordnance disposal officers. Two-hundred-and-thirty-six United States Marines, and 35 very tough, very well conditioned Navy SEALs. Because we know that a nation must have pride in its history to have confidence in its future. We are the nation that build the highways, the railroads, the Empire State Building in one year, the Golden Gate Bridge, and we are the nation that built the Panama Canal. We trekked the mountains, explored the oceans, and settled the vast frontier. We won two world wars, defeated communism and fascism, and put a man on the face of the moon. We cured disease, pioneered science, and produced timeless works of art that inspire the human soul. And on distant islands, far away battlefields, above the skies and beneath the sea, the entire world has borne witness to the unstoppable strength, skill, and courage of the United States Navy and the American Marines. And this week, we passed a new landmark legislation to give more choice and better care to our great veterans. we are going to take care of our veterans. We are doing a great job with it. We are taking care, finally, after decades, we are taking care of our veterans. We passed VA accountability. Everybody said it could not be done. If you didn’t do a good job, you could not get fired. Now, you don’t do a good job and take care of our veterans, they will look you in the eye and they say, “Jim, you’re fired! You’re out! Out!” Get him out of here. They all said you could not get it. They tried to get it for 35 years. We will say, get him out of here, he doesn’t take care of our vets. And if a fight must come, there is no other alternative, victory, winning, beautiful words, but that is what it is all about. We are reestablishing the second fleet in the Atlantic: bigger, better, stronger than it has ever been before. We are rebuilding our defense industrial base to forge American iron, aluminum, and steel, which by the way, we just put tariffs on when it comes in from other countries. Okay? We are taking in a lot of money now, our country. They pay that big, beautiful tariff and it goes right into building new ships. Also, there is another word that’s never used, and I will use it today. It’s called talent. We have talent and a lot of other people don’t, and a lot of other countries don’t. We have great talent and I have seen it. In other words, we are showing what is possible when America starts acting like its sailors and marines. Our nation cannot be strong without the heroes whose hearts stir the words: Don’t give up the ship. Famous phrase. We even use it in business. Things are going bad, you say don’t give up the ship. Keep fighting. Don’t give up the ship. But it’s really, you guys started it. With us today are living symbols of that long and unbroken chain of American patriots, members of the Naval Academy class of 1968. That’s great. Stand up, please. please. Exactly 50 years ago, they were in your shoes. They embarked into service and they made America very proud. To everyone in the class of 1968, we thank you and we salute you. So to the Naval Academy of the class of 2018, I say a number of things. Number one, I say that I was given an option. I could make this commencement address, which is a great honor for me, and immediately leave and wave goodbye or I could stay and shake hands with just the top 100, or I could stay for hours and shake hands with 1,100 and something. What should I do? What should I do? I’ll stay. I’ll stay. I will stay. Does it Get Any Worse than This?Who Cares More about the Constitution - Democrats or Republicans?